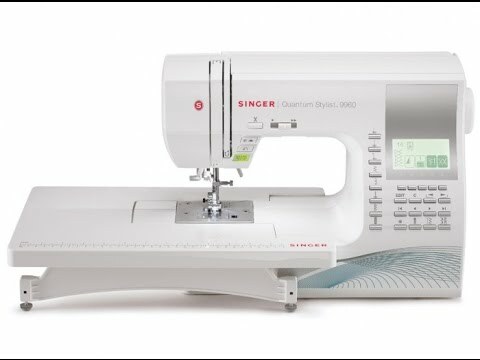 The Quantum Stylist 9960 sewing machine is the perfect tool for the budding designer. Give every piece a personal touch with five stunning fonts and 600 built-in stitches. Mix stitches and lettering to create unique stitch sequences for endless possibilities of customized projects. Many stitches can be mirror imaged and elongated for even more creative options. Use the Needle Up/Down feature for easy pivoting like sewing on a pocket, topstitching, free-motion quilting, applique and more. Set the maximum sewing speed of the machine where you want it with the Speed Control – faster for long seams like those on curtain panels, or slower for more intricate projects – you're always in control. The Top Drop-in Bobbin is easy to thread and easy to see, so you won't run out of thread in the middle of a seam. When you're done stitching, a simple press of the Thread Trimmer Button will cut both the top and bottom thread, saving you time. This machine has all the features you need to get your masterpieces runway-ready.